John Gimlette describes his three months of travels in Sri Lanka. Few places are as contradictory. The island is home to over 7,300 wild elephants and yet it’s only the size of Ireland. For the last three decades, it’s hosted not only an alluring tourist industry but also the most savage civil war Asia has ever known (1983-2009). Venturing into the remotest corners of the country, John reveals a country that is beautiful, wild and occasionally bloody. John Gimlette describes his three months of travels in Sri Lanka. Few places are as contradictory. The island is home to over 7,300 wild elephants and yet it’s only the size of Ireland. For the last three decades, it’s hosted not only an alluring tourist industry but also the most savage civil war Asia has ever known (1983-2009). Venturing into the remotest corners of the country, John will be offering advice for those wishing to share in the beauty and strangeness of this remarkable country. John Gimlette will transport us to Sri Lanka. Home to thousands of wild elephants, he will introduce us to a country whose natural beauty has endured, indifferent to human tragedy. Lecture starts at 1.15pm and ends around 2.30pm. A sandwich lunch is available from 12.30pm and must be booked via the office by 2.30pm the day before. Tickets: Free. Members and their guests only. John Gimlette describes his three months of travels in Sri Lanka. Few places are as contradictory. The island is home to over 5,800 wild elephants and yet it’s only the size of Ireland. For the last three decades, it’s hosted not only an alluring tourist industry but also the most savage civil war Asia has ever known (1983-2009). There was once a time when outsiders felt they knew this island. Now, we’re not so sure. 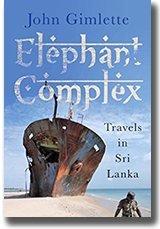 In this lecture, Elephant Complex, John Gimlette will describe his three months of travels in Sri Lanka. Few places are as contradictory. The island is home to over 5,800 wild elephants and yet it’s only the size of Ireland. It’s rich in culture and resources, and yet it’s given to moments of inexplicable rage. For the last three decades, it’s hosted not only an alluring tourist industry but also the most savage civil war Asia has ever known (1983-2009). There was once a time when outsiders felt they knew this island. Now, we’re not so sure. During the lecture, he’ll be taking us back through the past; to the great medieval reservoir cities; to the Portuguese cinnamon forests; to the Dutch forts, and to the British tea plantations. Then, he’ll be heading north, into the crucible of the conflict, finishing on a battlefield the size of Central Park and still littered with over 10,000 burnt-out vehicles. This is not a place that yields its story easily, but what emerges is an astonishing land of ingenuity and catastrophe, and a people swooning with denial. Along the way, we’ll meet terrorists, test cricketers, a former president, ancient tribesmen, the victims of great massacres and perhaps even the perpetrators. There’s no promise of comprehension in this tale, just complexity revealed. At Thornham Village Hall, Thornham, Norfolk. Doors open at 6:30pm, talk starts at 7:00pm prompt and finishes at 8:00pm. In August, Wild Coast was short-listed for the Dolman Travel Book Prize 2012. The final result is made public on 5 September 2012. John's next speaking event will be on 16-18 November 2012 at the Castle Hotel, Taunton. There, he will be joining a symposium of fellow travel writers, including Benedict Allen, Tim Butcher, William Dalrymple, Robin Hanbury-Tenison, Justin Marozzi, Iain Sinclair and Sara Wheeler. Booking details can be found on www.martinrandall.com. 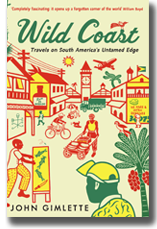 John Gimlette’s fourth book, Wild Coast: Travels on South America's Untamed Edge, is set in the Guianas. Lying between the Orinoco and the Amazon, the Guianas make up a fabulous forested land, barely explored. Much of it seldom sees sunlight, and new species are often tumbling out of the dark. Shunned by the conquistadors, it was left to others to carve into colonies. Guyana, Suriname and French Guiana are what remain of their contest, and the 400 years of struggle that followed. The book was published in the UK on 3 February 2011, and in the USA on 21 June 2011. It is also currently being translated into Polish. So far, John has given a number of talks. On 22 January 2011, he was a guest on Radio 4's 'Excess Baggage', talking about the book. You can get the link to the broadcast by clicking on the link on the homepage. On 7 February 2011, John gave a lecture at the Royal Geographical Society in Kensington. The following night, he gave a lecture to the city branch of the RGS. It is estimated that over 900 people attended, and the lecture is available to RGS members on its website. On 5 March 2011, the Globetrotters Travel club hosted a talk (for further details see http://globetrotters.co.uk/blog/march-5th-2011.html). John also spoke at several other literary festivals including Oxford (8 April 2011), Swindon (9 May 2011), Wandsworth (18 May 2011), Hay (1 June 2011) and Edinburgh (21 August 2011). In November 2001, John spoke at The Explorers Club in New York. In 2005, John began work on a new book which this time involved a journey from the South of France up through Alsace, Lorraine, Swabia, Bavaria and finally into the Austrian Tyrol. For some time he’d been intrigued by the question of what had become of the Europe that had been so bitterly contested in 1944-45. The future of our world had been contested here, but what had become of the battlefields today? The journey itself was based on the wartime experiences of an American WW2 veteran called Putnam Flint. John Gimlette had met Flint quite by chance through friends in London, and after some hesitation, Flint agreed to accompany him back along the old campaign trail. It would be Flint’s first return to France in 60 years. The journey was completed in October 2005 although John Gimlette returned to the continent several more times over the next year or so, in order to research the story further. As to what the book is about, see ‘Books’ below. In March 2008, the book was featured on the BBC Radio 4 programme, ‘Excess Baggage.’ John Gimlette was also a guest on several television and radio shows in the United States. Putnam Flint continues to thrive, as does another character in the book, Nancy Wake (who is comfortably into her nineties). Sadly, however, Air Chief Marshal Sir Lewis Hodges and Charlie Kennedy did not live to see publication of this book. As a result of the publicity surrounding the book, Putnam Flint was reunited with his old wartime buddy, Max Heller, of Camarillo, California. They had not seen each other for 60 years. 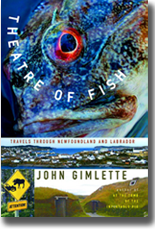 John Gimlette spent much of the summer of 2002 in Newfoundland and Labrador, researching his second book, Theatre of Fish. It was published in 2005. In February 2005, John Gimlette was invited on Radio 4’s Midweek programme to discuss the book with Libby Purves. In March 2005, he went to Toronto and Newfoundland for the launch of the book. He gave several radio and television interviews, to CBC and local networks. John Gimlette has also been interviewed on two occasions by CBC radio, St Johns. The first interview yielded an interesting contact. A listener got in contact with John, having heard him interviewed, and was able to provide him with some useful information as to his great-grandfather's visit to Labrador. Until then, there had been some mystery as to what happened to some archaeological artefacts that Dr Curwen had collected near Hopedale. The listener was able to reveal that the artefacts had been presented to the British Museum in 1933. In 2007, the Gimlette family donated Dr Curwen’s collection of photographs and diaries to the government archive in St John’s. The family retain full copies of all the documents presented. 'The Pig' was launched in the UK in January 2003 and in New York in February 2004. The British paperback version also came out in February 2004. It came out in Italian shortly afterwards. Following the launch of 'The Pig', John Gimlette - together with a number of other emerging authors - was featured on the cover of the Waterstone's Magazine in January 2003. He was also interviewed on BBC Radio 4's 'Excess Baggage', on LBC and on Radio Scotland. Extracts from 'The Pig' were serialised in The Times and The Independent. The reviews of ‘The Pig’ are set out on a separate page. It was nominated as Matthew Parris’ Book of the Year in the Sunday Telegraph’s round-up, in December 2003. In December 2004, it was named as one of the New York Times Review of Book’s 100 notable books of the year. There have been a number of developments since the book was published. The Colorado Party continues to hold the reins of power, although, as a party, it is deeply divided. The British Embassy has closed, and all its staff have been withdrawn. As to the characters in the book, Robert Eaton has died (well into his nineties); Jorge Halke of Neuva Germania was assassinated as a result of a labour dispute; Jakob Unger migrated to Canada, and Nurse Baker has retired. Meanwhile, John Gimlette has received a large number of emails from readers. Of particular interest are those from young Paraguayans. Many have commented that they have discovered more in the book than they ever learnt at school. It is a matter of some sadness that only now the truth about Paraguay’s recent political past is beginning to emerge. 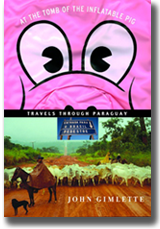 On 29th March 2004, John Gimlette gave a lecture to the members and fellows of the Royal Geographical Society on the subject of Paraguay. Since then, he has maintained an active interest in Paraguayan affairs, and is a keen member of the Anglo-Paraguayan Society.